Over the last few years the government has cracked down on car drivers who have switched tires for the season but haven’t had their Tire Pressure Monitoring System (TPMS) replaced. Most garages used to replace them for free back in the day but nowadays you will see plenty of garages charging for this. The truth is that you can avoid this, and you can also avoid having any issues with your TPMS when you switch from summer to winter tires. One big tip is to avoid pot holes because our roads are scattered with these annoying dips and they do have a massive effect on tire pressure, not just in cold conditions but during any time of the year. If you are driving on well-known routes then just pay attention to these, and avoid them if you can. Why Does Cold Weather Affect my TPMS? Snow is always going to set off your TPMS sensor, and it won’t take long until you see that lovely light illuminate your dash. Are you ready for the science behind this? 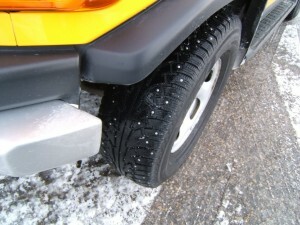 When we get a bout of cold spells, or snow, the air in your tire will become much denser than when it is warm, especially when the car has been left overnight during a particular cold or snowy period. However, as soon as you have drove around for 20-30 minutes you should notice that as the tires get warmer through friction, your light on the dashboard should turn itself off. Just give this tip a try before you decide to take it to our local garage as you should find that this works. Oh, and you shouldn’t worry too much on colder mornings if you see your TPMS light show up, that is normal behavior. If you are seeing the light more frequently, just be aware that for every 10 degree drop in temperature, you will lose on average 1 pound of air pressure out of each tire. This brings us nicely onto nitrogen for your tires. If you don’t check your tire pressure regularly then some good advice is to start using Nitrogen which will help in reducing TPMS resets. Most new cars come with these funky new dashboard lights that tell you when your tire pressure is low. The problem is, you will stop by a garage and pump air into them, and then hey presto a few weeks later that lights back on again. However, if you were to use nitrogen your tire could last months longer, meaning you don’t have to see that annoying flashing light appear so often. You see, replacing oxygen, water vapor and other gases that go into a standard tire, with nitrogen, will mean your tire pressure will maintain at a certain level for a lot longer. So if you were to use 95% nitrogen in your tires you would be looking at a retainer of optimal pressure for as much as 4 times longer than if you had 22% of oxygen, water vapor and other gases. Perhaps the biggest reason for people using nitrogen is that not only can you keep a well-balanced tire pressure but you can increase fuel efficiency, safety and generally a longer tire life for each of the 4 tires on your car. Learn more about tire sensors at the Tire Sensor Warehouse.